The exclusive array of Digital Panel Meter available with us is dispatched to the clients at highly economical prices. 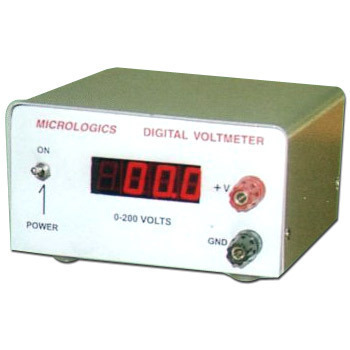 These give a highly accurate reading of the voltage or current that is further calibrated using advanced calibration equipment. As a result, these are highly appraised by the clients and can be bought by them at nominal rates. We are the largest manufacturer of Electronic Test & Measuring equipment for Educational Institutions. Ever since the inception of this organization, we have attained a steady growth in the field of manufacturing, supplying and trading Electronic Equipment. Our exclusive array comprises DC Power Supply, Digital IC Trainer, Decade Inductance Box, Decade Resistance Box, Decade Capacitance Box and Digital Panel Meter. In addition, we offer Decade Resistance Boxes, DC Power Supplies Ml 302, DC Power Supplies Ml 302D, Digital IC Trainer Kit Ml 555T, Digital IC Trainer Kit Ml 444T and Digital IC Trainer Kit. These possess high reliability, dimensional accuracy, efficiency and excellent performance. Being widely recognized as a client centric organization, we believe in delivering only supreme quality products to our esteemed clients. For this purpose, the procuring agents ensure that only qualitative products and raw material are procured from the authentic vendors of the industry. Further, our expert engineers & technicians are well aware of the emerging demands of the industry and changing market trends. As a result, they see to it that the products manufactured, are in sync with the latest techniques and trends of the industry. Besides, our customer support executives are efficient in rendering quality after sale services to the clients as and when demanded. Owing to these reasons, we have been able to garner a huge clientele across the nation.